Jessica Sim can’t pinpoint the exact moment that she became concerned about the global environmental challenges we face today; to her, it feels like a concern that has been part of her world since she was young. She recalls how her high school art teacher, who ran a high school ‘green team’, was the first person to introduce her to the idea that art might be integrated with environment. Jessica trained at London Contemporary Dance school and gained a Masters degree in International Performance Research. Throughout this, Jessica retained a focus on environmental concerns, writing her MA thesis on the integration of environmental activism and performance. After graduating from her MA, Jessica moved to Istanbul where she began her professional career working with art and creativity to address environmental matters. One of Jessica’s first professional projects following her MA was titled ‘Museum of Garbage’. This project, run as part of a collective titled FLYING roots, took rubbish from the streets of Istanbul into a gallery space, sparking dialogues regarding the legacy and implication of human created garbage. In light of her personal and professional interest in both creative practice and environmental issues, the core topics at the heart of Creative Climate Leadership were not radically new concepts for Jessica. For Jessica, CCL’s greatest impact is through the communities it forms and the encouragement it offers. Working on environmental issues can be a personally and professionally challenging process. Having the space and opportunity to share these experiences and strengthen support networks is invaluable. 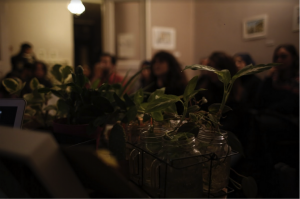 Following her participation in the Creative Climate Leadership course in Wales in March 2017, Jessica received a CCL in Action grant for Yeşillendirelim, a series of discussion-based workshop events and a pop-up exhibition at CIRCUIT in Istanbul, a space that she co-founded and was managing at the time. The project was structured as a research-in-action and co-creation project, responding to the needs and interests of its participants and the community. The first workshop brought together 15 individuals to pot plants to decorate the interior of Circuit. They followed this activity with a discussion and homemade refreshments. The second workshop focused on building connections, both with each other and the surrounding urban environment. People were asked to notice and/or bring something along from their neighbourhood. People’s experiences and objects were mapped to the neighbourhood to spark a discussion about what we notice in our environments, local food sourcing, and consumption. It was also followed up by a visit from a local school class, who were invited to make their own contributions to the map. The third workshop was themed around the need for more opportunities and spaces for people to share skills, especially making by hand. It was co-run with participants from prior workshops, focusing on planting and propagation, macrame, and nature crafts. It included a pot-luck dinner, in which people were encourage to bring a dish (whilst avoiding unnecessary food packaging of course)! ended up being a bit like a speed-dating event . . . we set up this space with all of these places for two people to sit and set up questions that were prompting people to talk about a particular issue or how they relate to their environment in the city. People were designated either to be a listener or a speaker. So you would enter the space and you ended up being across from somebody who you maybe did or didn’t know, and you’re given a role of speaker or listener and then you had a question to prompt you to talk about something related to ecology in the city. And then there was a place for you to write and give feedback about what you’d experienced. The opportunity to run this CCL in Action project gave Jessica the chance to form stronger links with her local community, meeting a number of individuals working on similar topics in her immediate area. Through the project, Jessica also met the person who would soon become her new business partner. 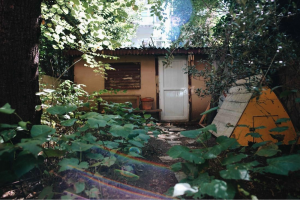 Jessica’s new business venture, created and co-directed with her business partner Ahu Toksöz Kopan, is an arts and creative space in Istanbul that supports creative projects and practices around the theme of urban sustainable living. Since its conception NADAS has grown into a thriving community, running daily yoga and art sessions, hosting relevant events and exhibitions and supporting two artists in residence. Jessica describes how, through providing her with the opportunity to connect with her new partner, CCL has had a direct and lasting impact on her career, solidifying her commitment to art and environment and the opening of a new arts space has served as a big step in her career development – which has also become more financially sustainable. Jessica’s experience speaks to how just one project, or even just one connection, can open up a multitude of further dialogues and opportunities; connection building is at the heart of CCL.